Samurai Jack is an American animated television series created by animator Genndy Tartakovsky that aired on Cartoon Network from 2001 until 2004. It is noted for its highly detailed, outline-free, masking-based animation, as well as for its cinematic style and pacing. The plots of individual episodes range from dark and epic to light-hearted and comic, but typically follow Jack in his singular quest to find a method of traveling back in time. 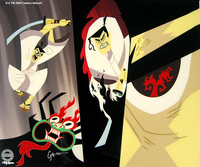 Many of the battle scenes in the series are reminiscent of samurai films, and since Jack's robotic enemies "bleed" oil or electricity and monsters/aliens bleed slime or goo, the series is able to exhibit the action of these films while avoiding censorship for violence.